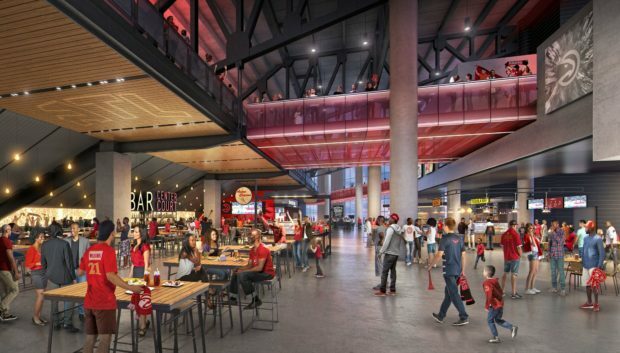 ATLANTA, GA – The Atlanta Hawks are looking to staff more than 900 new jobs in preparation for the opening of the transformed Philips Arena upon completion of its $192.5 million renovation. Part-time supervisory and non-supervisory positions will be available in a number of different areas, including guest services, security, housekeeping, food service, and more. The massive hiring push will begin by filling approximately 40 Guest Services Captains roles. In a distinctive process, 150 pre-screened candidates have been invited to a multi-location interview that will include stops at the arena’s interactive preview sales center, the venue’s active construction zone and the Skyview Ferris Wheel. Each stop is designed to educate potential new hires on the extensive changes going on at the 20-year-old building and convey the fun and high-energy atmosphere of the workplace. The venue recently announced fan-friendly food pricing, is focused on delivering a world-class guest experience steeped in southern hospitality. These roles represent the ‘front line’ in providing fans with memorable moments at every event.